The importance of positive reviews from your customers is no secret, and it is now becoming more important than ever for small businesses. According to a survey done by Zendesk, 90% of participants stated that positive online reviews impacted their buying decision, and 86% said their decision was changed by negative reviews. However, customers are no longer your sole target to impress, because Google is now implementing a qualitative element as a ranking factor. What is this qualitative factor? Google is implementing adjectives like, “best,” “outstanding” and “awesome,” into their snack pack interface to trigger a new search results display. For example, looking below at the example on the left, we can see that Google only shows queries that were ranked over 4. 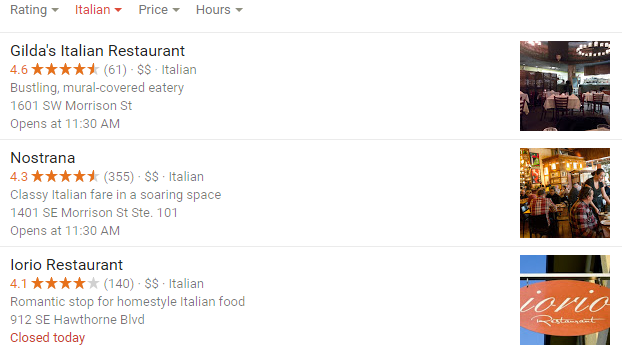 However, after taking the word “best” out of the search, different results are shown that are ranked lower and have considerably fewer reviews, indicating lower popularity. Another way that Google is incorporating qualitative features into their ranking system is by placing organic search results above the display ad, of sites that have reviews of the topic you’re searching for. 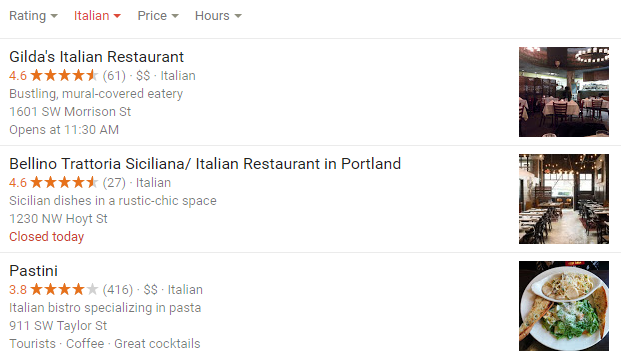 For example, you can see below that an Oregon Live result is shown above the display ads for, “Portland’s 10 best Italian restaurants.” This is because this specific Oregon Live page is focused on optimizing for the word “best” and as an Italian restaurant business owner in Portland, you would want to be on that page. So, what does this mean from a marketing standpoint? It means that a strategy for acquiring positive reviews needs to be executed, however sometimes it can even be a struggle just gathering reviews in the first place. Here’s how to grow your number of responses. Ask. You will never reach your goal of gathering a strong set of positive reviews if you don’t ask. Most customers understand that reviews are an important element when it comes to running a business and won’t mind taking the time to write a review, if you provide them with an excellent product or service as well as an enjoyable experience. Do it ASAP. Make sure you are sending out your request for a review within 1 day of the product or service so that the customer’s experience is still fresh in their mind. They will be more inclined to respond if they can remember exactly how they felt during the experience with your business. It is also important to send out a reminder within a couple days of the first request. Many customers have busy lives and writing a review for your business is not going to be at the top of their to-do list. Reminders are essential. Make it easy. First, you need to make it easy for your customer to find. For example, if you send out requests for reviews by email, make sure that you have a direct link for them to submit their response. Don’t make your customer go out there and try to find it, because they won’t spend the time to do that and you will end up losing an opportunity for a review. Next, having multiple channels for them to leave reviews can make it more convenient for the customer’s preferences. Lastly, make it short and sweet. If you have your review formatted as a questionnaire, limit yourself the number of questions you will be asking. The shorter it is and less time it takes, the more likely the customer will take the time to do it. Offer incentive. A customer will be more likely to complete a survey if there’s something in it for them -that’s just common sense. However, make sure that you are giving an incentive for just a review and not a “good” review. You don’t want it to seem like you are buying positive reviews and that your reviews are ingenuine. In fact, offering incentives for reviews has become quite a controversy, so it is important that you are clear with your intentions. One way to avoid this conflict is by offering a small percentage off, instead of giving away free products or gift cards. This way, you are compensating a loyal customer for taking the time to leave a review that will help you better serve them. Thank them. There is nothing worse than not being appreciated for your efforts. Make sure you send a follow-up email or phone call (depending on your business and review source) to thank your customer for taking the time to fill out your review. This will go a long way in retaining customer loyalty and continuing to get positive reviews from them in the future. 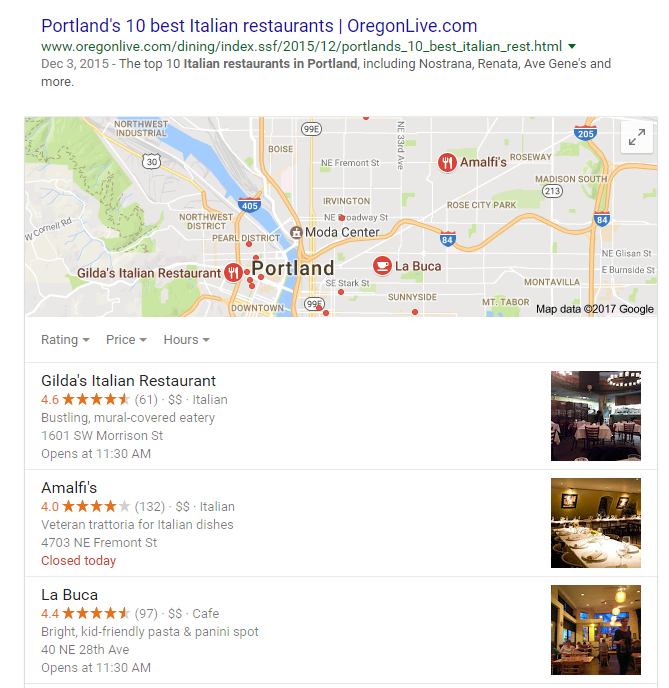 In the end, we all know that positive reviews on Google are great to have, but now more than ever, they are crucial if you want to show up in local search results when a potential customer wants, and searches for “the best”. Simply having a local listing isn’t enough anymore. If you need help optimizing the quality of your business’ presence to advance on Google’s search results and new search results display, contact Anvil, and we will get back to you as soon as possible!